How To Grow Raspberries in the UK? I am a huge strawberry growing fan and to be honest it was only a few years ago that I decided to start growing raspberries. The reason for this was actually twofold; I had never done it before and my wife wanted some home grown raspberries to add to various pie fillings. Now being a bit of a glutton for my wife's home baked pies it was a bit of a no brainer for me to succeed at doing this. It would also give me a new challenge, something I always enjoy. I have grown other soft fruits before but raspberries did indeed pose a few new challenges. The plants do grow fairly tall and the birds appear to be more fond of those than strawberries. They also take a little more work and require annual pruning. They also need a good degree of support so all in all more work than the easier strawberry. They need to be planted to avoid strong winds. They are best planted in November or March. Leave 18" between plants and if you are making more than one row, the leave a 6 feet space between rows. Raspberries do however provide crops for around 10 years so a wiser investment in the long term. They prefer cool damp summers to grow best and the raspberry season extends over 4-6 weeks so a decent return. I also like the colour of the berries and they do add a nice difference to a garden. How To Get Started With Raspberries? The best advice I can give you starting out is to plant your root stool in a raised bed. You absolutely need well drained soil and with a raised bed you can guarantee this. It isn't essential to do this, but it will most certainly help a lot. I mentioned earlier that raspberries do require quite a lot of support for healthy growth. The easiest way to provide support is to have your raised bed near a strong fence. When I came to do that I didn't have that luxury. Therefore I just inserted a few posts into the raised bed and strung some garden wire across them. That is a fairly basic structure and doesn't take that long to do. Make the height of your structure around 6 feet high and about 3 metres (10 feet) between the posts. Attach the wire at 2 feet, 3 feet and 5 feet so three strands running horizontally. Once you have that done then buy your plants and similar to strawberries, my advice is to get a summer fruiting variety. 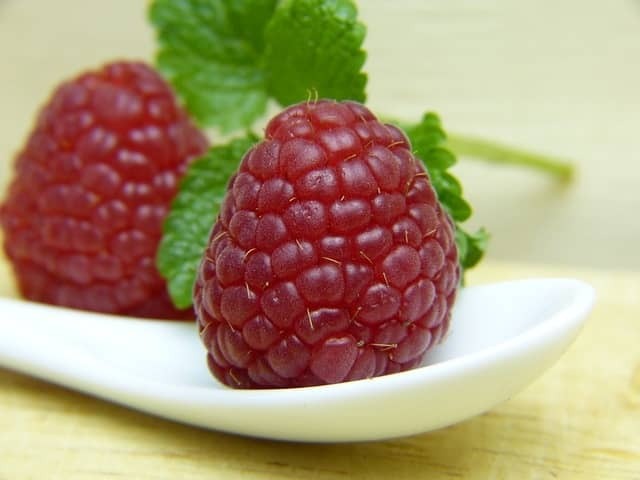 Video - How To Grow Raspberries from Scratch? I found out rather quickly that once these started to grow I had two enemies, birds and viruses. You will need to protect from the birds and you want to ensure that when you buy your plants, they are guaranteed virus free. Irrespective of what type of raspberry plants you buy, they will eventually deteriorate over 8-10 years and will no longer be of any use. Which Raspberry Varieties Should You Pick for UK Weather? When Spring arrives then cut the raspberry cane down to near ground level. This may sound severe but they grow quickly. After you have picked your raspberries in the summer crop then keep the best young canes and attach to the wire and remove the older canes. Around February to March then cut back any tall growth to a couple of inches above the wire. You should be left with all the old canes cut to ground level and the new ones attached to the post and wire structure. Raspberries need plenty of water especially when the fruit starts to appear. Hoe out any weeds you see. I use a spray to deal with the hateful raspberry beetle and I usually mulch in March/April. This is an option that is becoming ever more popular. For people with decks, patios, balconies or limited space the pot or container is always a very good option. Just be aware that a raspberry cane or bush can grow to around 3-5 feet high. You should ideally use five gallon pots and start with around 5-6 canes. Any container used should be around 36" wide. They will need a lot of sun and plenty of water. Anything grown in a container usually needs more regular watering. Make sure of course that your container has plenty of drainage holes to avoid root rot. The newer types of raspberry bush are a better size and these include the "Heritage "and "Raspberry Shortcake" varieties. Here at the website we are asked many questions as I am sure you can imagine. Just below we have put together our best answers when it comes to asking questions about raspberry growing. Q. How long does it take to grow raspberries? The first year is a time for planting. In the second year your bushes should bear fruit for around 6 weeks. A good tip here is to buy different varieties, and they will fruit at different times. Typically in the UK the berries bloom in June through to August depending on the variety. Q. Do raspberries need a lot of sun? For most varieties of raspberry bush a lot of sun is required. There are some varieties which will do OK in shaded conditions. If you have a garden that is shaded most of the time, ask at your local garden centre if they stock raspberry bushes that will bear fruit under shaded conditions. Q. Can you grow raspberries from cuttings? Yes and for many UK gardeners that is their preferred method. Ideally plant those in the spring (late Spring) when they are about 6-8" tall. Q. Do raspberry bushes spread? They most certainly do and would be classed as an invasive plant. They will grow into long canes and produce a lot of berries. Bushes grow anything between 3-5 feet tall with a 24-26" spread so pruning for most gardeners is essential. Q. When Should You Plant or transplant Raspberry Canes? Early Spring is the best time for transplanting. Q. What other plants grow well with raspberries? Avoid other berries if you can as raspberries can be quite greedy. Alternatively you could grow raspberries in a pot. Avoid growing raspberries in a garden where there are either blackberries or potatoes growing. Q. How far apart should you plant raspberries?